It's the most wonderful time of the year: fact. So if you're in need of festive things to get you in the mood, I've got ten of 'em to make you more than a lil' bit merry in Manchester. With fire pits, fairy lights, blankets and festive drinks, it's the perfect spot to start the Christmas countdown and makes a great date night spot. Sometimes the city can get a little bit too much, so hop on a tram to Salford Quays for a breath of fresh air, literally. Walk down the ship canal before stopping for a festive cocktail (or three) at The Alchemist overlooking the water. It makes many a great 'gram and the heaters outside will keep you warm. Schedule a sesh for sunset and see Media City's twinkling lights come to life. They kick off Friday 11th November until mid December and are known across the country and world. Yes they're busy but there's a reason for it, so wrap up, grab a mulled wine and browse all they have to offer. Not just limited to Christmas, but something you should treat yourself to now the temps are dropping. Manchester has many a great place for a cracking roast dinner, so get googling and drooling stat. 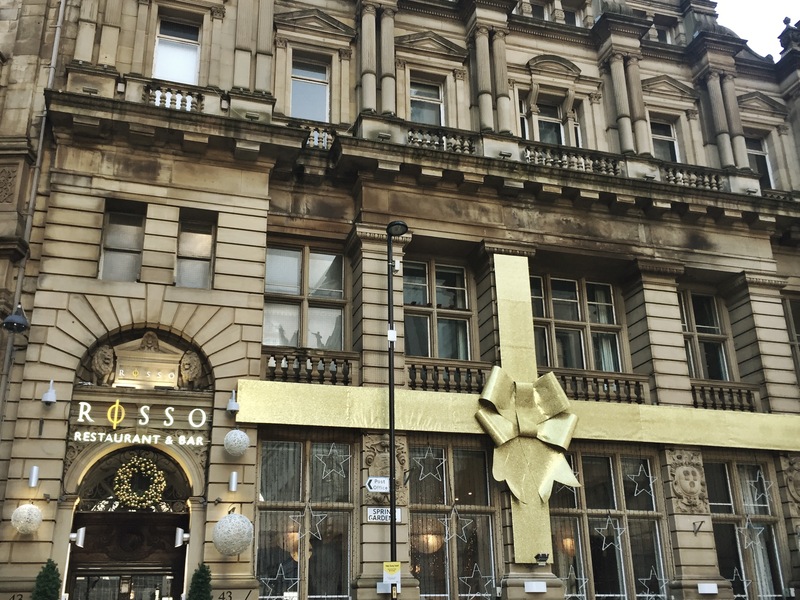 Manchester's highest bar offers a welcome escape from the frosty weather outside. Serving nibbles, afternoon tea and all the drinks you could ever want, book an evening slot to see just how pretty that view is from 23 floors up. Oh no she didn't, oh yes she did - yep a panto is always a great shout at this time of year, so grab the family and pick your fave fairytale as the city and surrounding areas boast lots of options to pick from. It's a classic for a reason, so make yourself ready to snap away when the red truck visits The Trafford Centre on the 1st and 2nd December. Pics or it most definitely did not happen. Apparently. Head down to Spinningfields where Bar Hutte are on hand to whisk you away in an alpine inspired hut where you can sip mulled wine and do some karaoke with the gals. Booking ESSENTIAL. Try a different kinda singing at a local carol service. Manchester Cathedral is a stunning building that offers just that.